Spring exploded this weekend in Paris. With temperatures in the 70s Fahrenheit and a soft April sun, the neighbors began eating dinner on their balconies and transforming the sidewalks just outside their rez-de-chaussées flats into the tiniest echoes of sidewalk cafés. Up the stairs, on the rue Caulaincourt, the largest flea market I've ever seen stretched from the rue Ramey almost to Square Caulcaincourt, about a mile if you count both sidewalks. The merchants and tag-salers had everything from rusted fencing foils to 33' records of Peter, Paul & Mary to the pair of skinny jeans that I bought for 7€. Lots of ugly shoes and rather nice sketches. Everywhere, the restaurants spilled onto the walks, the balconies, the terraces, where the trees are leafing out and the blossoms floating down. Meanwhile, just down the street, at the Square Léon Serpollet, which is our local park, the children and the flowers -- sometimes it was hard to tell one from the other -- were riotous. French children, like European children everywhere I think, are treated differently from their American counterparts. They're adored, and quite rightly too; how on earth did those tiny human beings learn to speak French with such perfect accents? But they are regarded as a special species of human being with the right to inhabit their own world. So they are left alone in the park far more than we leave ours alone in, say, NYC parks. There's a toddler section where parents help 2-year-olds build sand castles or bob on the horsies, but the rest of them are scrambling around, including on the fabulous and precarious fountain that isn't running yet, with very little supervision, and when they scrape their elbows and start bawling, usually some other child will come over and comfort of scold them. As I sat by the flower bed reading Janet Flanner's Paris Was Yesterday, which I'm teaching this week, every now and then some 7-year-old would stand at the foot of the winding path leading up to the playground and bawl, "BERTRAND! ON PART!" or something to that effect. Sometimes Bertrand came, sometimes he didn't. They left. I figure the parent came back later and got Bertrand. 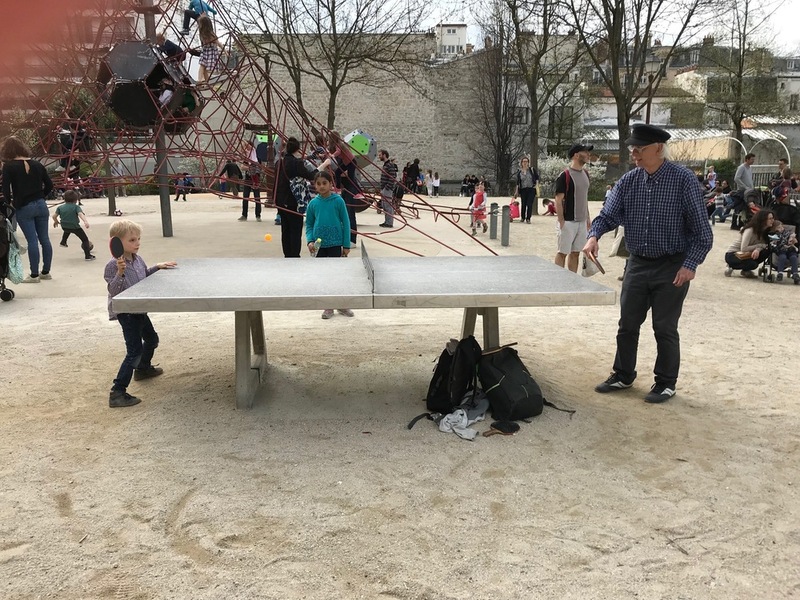 But while there's deliciously little adult intervention, there are the two older guys who've decided to spend their retirement playing ping-pong in the park with children. They're sort of the Mr. Rogers of this neighborhood. They'll play with any child of any age and adjust their game to suit the level of their opponent. When one kid has to run off, they'll tap the shoulder of another kid, who's always eager to play. I think they supply the paddles and balls, too. They seem to live in the park, and they exude happiness. Today I walked back to our little flat thinking for the first time that I could get homesick, once we are away from here. Spring changes everything.